8 Marlborough is located on the south side of Marlborough, between Arlington and Berkeley, with 6 Marlborough to the east and 10 Marlborough to the west. 8 Marlborough was designed by architect Nathaniel J. Bradlee and built ca. 1864, one of two contiguous houses (6-8 Marlborough) built for Frank William Andrews, a real estate investor and former importer of iron and crockery. He sold 8 Marlborough and retained 6 Marlborough as his home. The land on which 6-8 Marlborough were built was a combination of two lots: one with a 25 foot frontage on Marlborough to the east which had been acquired from the Commonwealth of Massachusetts by Dr. John Homans on December 9, 1858, and a second, to the west, with a 40 foot frontage acquired from the Commonwealth by Frank W. Andrews on February 27, 1860. John Homans sold his lot to Horace Jenkins and William Carpenter, and Frank Andrews bought it from them on April 21, 1863. He combined it with his lot, creating a 65 parcel which he subdivided into a 43 foot lot for his house at 6 Marlborough and a 22 foot lot for 8 Marlborough. Click here for an index to the deeds for 8 Marlborough. By 1865, 8 Marlborough was the home of William Marshall Stedman, Jr., a wholesale grocer, and his wife, Elizabeth Bowen (Brown) Stedman. They previously had lived at 9 Beacon. On March 23, 1867, Elizabeth Stedman purchased 8 Marlborough from Frank Andrews. The Stedmans continued to live at 8 Marlborough in 1868. By 1869. they had moved to the Norfolk House, and by 1870, they were living at 387 Beacon. On August 1, 1868, 8 Marlborough was purchased from the Stedmans by Dr. Elisha Tyson Wilson, a dentist. He and his wife, Charlotte Fales (Peckham) Wilson, made it their home and he also maintained his dental office there. They previously had lived (and he had maintained his dental office) at 167 Tremont. Cecil Porter Wilson, Elisha Wilson’s son by his first marriage, to Cecilia (Porter) Wilson, lived with them. He also was a dentist and maintained his practice there. Elisha Wilson died in June of 1872. 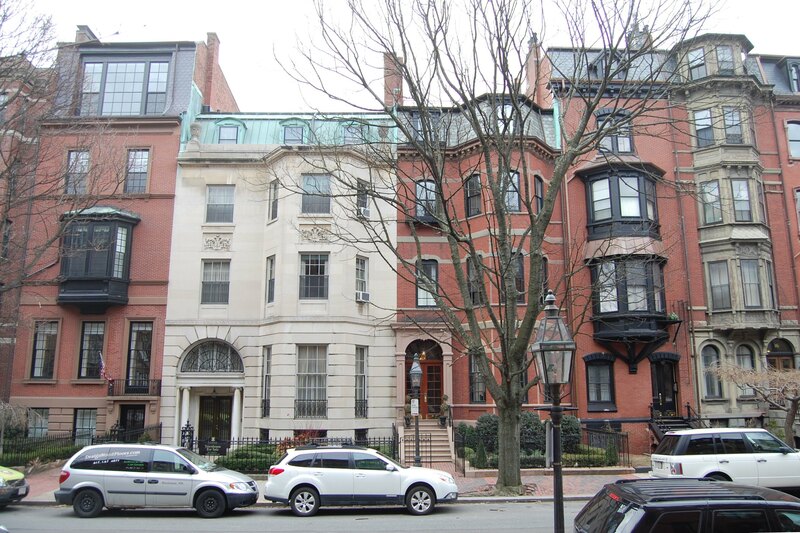 Charlotte Wilson moved soon thereafter to 4 Payson Court, and Cecil Porter moved to 143 Boylston. On September 14, 1872, 8 Marlborough was purchased from the Wilson family by dry goods merchant Gilbert Russell Payson. He and his wife, Althea (Train) Payson, made it their home. They previously had lived at 83 Marlborough They also maintained a residence in Belmont. 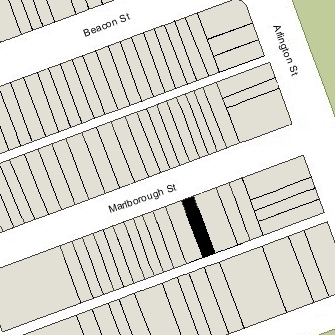 They continued to live at 8 Marlborough in 1881, but moved thereafter to their home in Belmont. On October 6, 1882, 8 Marlborough was purchased from Gilbert Payson by Lewis William Tappan, Jr. He also maintained a residence in Milton, where his wife, Olivia Buckminster (Lothrop) Tappan, had died in March of 1878. A lawyer by training, Lewis Tappan was an investor in various manufacturing companies and railroads. He had served as US Consul in Batavia, Java, from 1863 to 1866. He continued to live at 8 Marlborough until 1889, after which he made his home in Milton. On April 27, 1889, 8 Marlborough was acquired from Lewis W. Tappan, Jr., by Pauline Elizabeth Augusta (Agassiz) Shaw, the wife of mining investor Quincy Adams Shaw. She and her husband lived in Jamaica Plain and maintained a summer home, The Commons, in Pride’s Crossing. In April of 1882, she had acquired 6 Marlborough and opened a private day school designed to provide an education to her own children and to the children of families in the neighborhood. It was considered one of the most progressive schools in Boston, co-educational through all the grades and a leader in innovative curricula and methods. After she purchased 8 Marlborough, she used it as an extension of the school. It also became the residence of Miss Isobel Louisa Briggs, the school’s principal. In about 1894, Pauline Shaw began closing the school and thereafter appears to have used 6 Marlborough for other purposes. 8 Marlborough remained Miss Briggs’s home. In 1894, she was joined there by Mary Parker Follett, a Radcliffe student who had been invited by Mrs. Shaw to present a series of lectures to her older students. Mary Follett subsequently became a leader in social reform work, and later was respected author and lecturer on human relations, democratic organization, and management. Mary Follett soon moved, but Isobel Briggs continued to live at 8 Marlborough until about 1897, when she moved to Putney, Vermont. Isobel Briggs and Mary Follett moved back to 8 Marlborough in late 1900 (they had re-united and lived together for two years in Vermont). They continued to live at 8 Marlborough until October of 1908, when they moved to an apartment at 5 Otis Place. Pauline Shaw continued to underwrite many of Mary Follett’s projects and to pay her (and Isobel Briggs) a stipend which continued until Mrs. Shaw’s death in 1917. On October 22, 1908, 6 Marlborough was purchased from Pauline Shaw by Adelaide Angelique de Pelgrom (Cole) Chase, the wife of William Chester Chase. He was an architect and she was a still life and portrait artist. They previously had lived at 95 Beacon and he had maintained his office at 24 Marlborough. They also maintained a home in Annisquam. It probably was during the Chases’ ownership that the front entrance was lowered to street level and the top floor remodeled, possibly to provide a room with light from the north for William Chase’s office and/or Adelaide Cole Chase’s studio. William and Adelaide Chase rented space for use as medical offices. Between 1910 and about 1916, Dr. Herman W. Marshall, a phyisician, lodged with them and maintained his medical offices there. 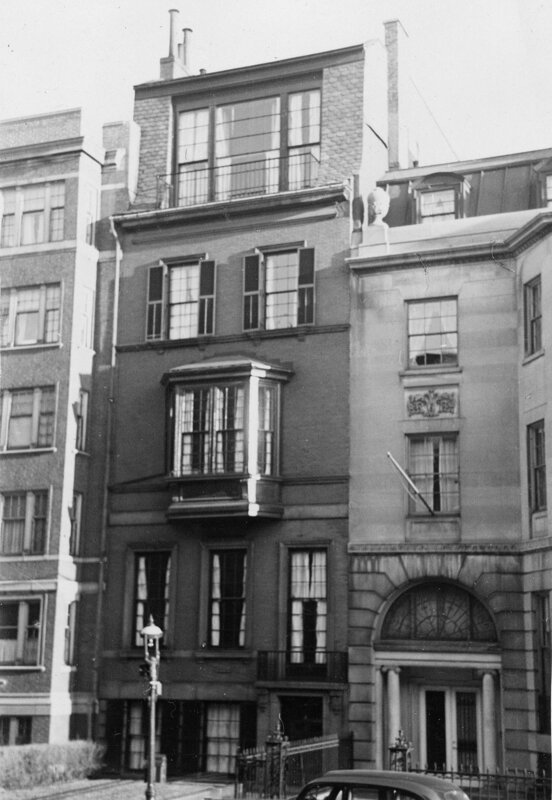 By 1920, Dr. Robert Battey Greenough, a professor at Harvard Medical School and a physician, and Dr. William Henry Smith, an instructor at Harvard and a physician, maintained their medical offices at 8 Marlborough. They both had maintained their offices at 10 Gloucester in 1917. Dr. Greenough and his wife, Amelia (Goodwin) Greenough, lived in Brookline. Dr. Smith lived with them until about 1923, when he moved to 379 Beacon. Dr. Greenough continued to maintain his office at 8 Marlborough until about 1936. Dr. Smith continued to maintain his office at 8 Marlborough in the 1940s and, from about 1947, also made his home there. He continued to live and maintain his office there until about 1953. Adelaide Chase died in September of 1944. William Chase continued to live at 8 Marlborough until his death in April of 1954. On June 18, 1954, 8 Marlborough was purchased from the estate of Adelaide Cole Chase by Shirley Clifford Speed. In October of 1954, he filed for (and subsequently received) permission to convert the house from a single-family dwelling into eight apartments. On September 1, 1959, 8 Marlborough was acquired from S. Clifford Speed by Keating & Company. They continued to own it for the next forty six years, until May 12, 2006, when they sold it to the Eight Marlborough Street, LLC (Stig Leschly, authorized representative). 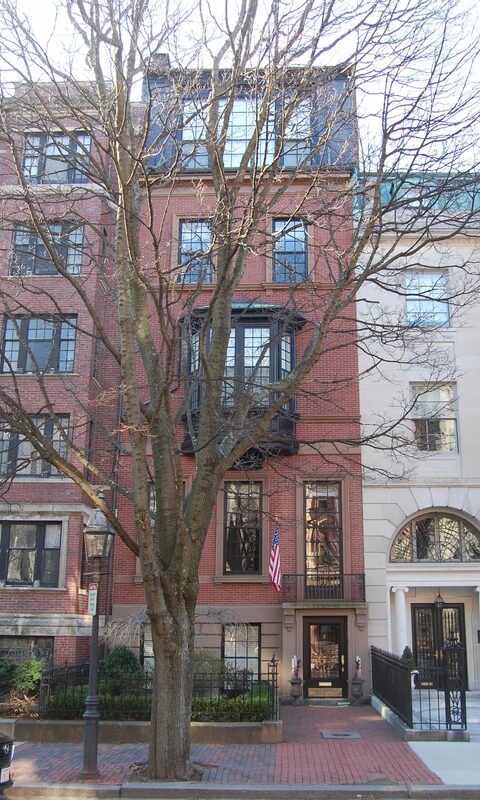 On February 8, 2007, 8 Marlborough was acquired from the Eight Marlborough Street LLC by real estate developers and building contractors John and Joseph Holland, as trustees of the 8 Marlborough Street Trust. In May of 2007, they applied for (and subsequently received) permission to remodel the property and convert it back into a single family dwelling. On July 8, 2008, the Hollands transferred the property to themselves as trustees of the 8M Nominee Trust, and on the same day they named Jessie Baker and Pamela Baker to replace them as the trustees. 8 Marlborough remained a single-family dwelling in 2015.